If the idea of working for yourself in the great outdoors appeals to you, a career in dog walking may be a perfect fit. 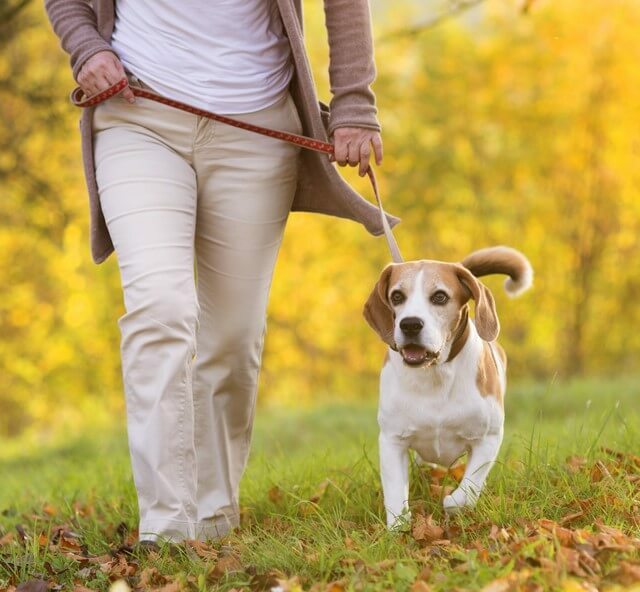 Dog walkers collect dogs from their owners’ houses, exercise them for a pre-arranged length of time and then return them, washing them to remove any dirt picked up during the walk if necessary. What are the responsibilities of a dog walker? I love it. I like dogs and I love walking, because I find it therapeutic. There’s a rhythm to walking, you can lose yourself in it and as I walk I daydream and work things through in my head. What are the key skills required by a dog walker? What qualifications does a dog walker require? No formal qualifications are needed in order to become a dog walker. However, any training in animal care will stand you in good stead both in practical terms and when you are advertising your services. If you have access to your customers’ keys and are going into their house to pick up and drop off their dog for walks, a Criminal Record Check is mandatory. This is a small expense but will make your job as a dog walker much easier and more profitable. It is also worth being trained in dog first aid in case of emergencies while walking. This is something that your customers will really appreciate – every dog owner wants to know their pet is in safe hands. Basic first aid kits for dogs are easy to come by and you can take them with you on your walk. You may wish to expand your repertoire and make more money by completing additional qualifications, such as grooming/trimming and dog training courses. Do I need relevant work experience to become a dog walker? No official experience is necessary, but you will need personal experience of caring for and walking dogs while providing good discipline. What are the prospects and salary of a dog walker? The pay of a professional dog walker depends largely on the area in which they are working, but it can be anywhere between £5 and £15 per hour. Dog walkers in affluent urban or exurban (commuter-belt) areas will be working for professionals and have the chance to earn more. How much a dog walker earns is also dependent on factors such as their working hours and how many dogs they walk and as such it is highly variable. Their salary could be anywhere between £9,000 and £32,000 per year. By the end of the day, I’m covered in sweat and 15 different types of fur. But the rewards of being greeted by one wagging tail after another as part of the job makes it worth every second. Is the role of a dog walker right for me? There are both pros and cons involved in the role of a dog walker. An active job that will keep you fit and healthy – you’ll have no need for a gym pass! Formal sick leave doesn’t exist and taking time off with little to no notice can be extremely difficult. Your customers, especially the professionals, may be dependent on you and taking the day off can greatly inconvenience them.